My friend Ginger sent us this fun monkey plate. We did an Asian food theme. White grape juice, mandarin oranges, a fortune cookie, vegetable lo mein, and a trial piece of sushi. Yeah, the sushi didn't go over too well. I think it's an acquired taste. I actually got the mini-chopsticks in San Francisco when I ran the marathon there 3 years ago. Pierce is finally big enough to pretend to use them. Chicken pic of the week: check out where Natasha is sleeping lately. If you don't like birds, don't look up! I love the monkey plate. The sushi on the mouth looks so cute. The oranges would go fist at my house. Natasha might rethink her sleeping place when she starts getting pelted by hickory nuts in next month! 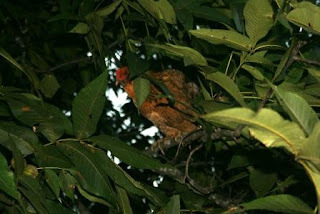 Aahw, seeing your chicken in the tree makes me feel sorry for mine! We lost one the day she arrived (Flew right out of the coop before we had even properly released her and we didn't get her safely back until 24 hours later!) and we've had to clip their wings. They still get up to a metre high though! We did an Asian theme today too! Yours turned out much better, but our dessert was rice krispie sushi. That sushi roll might go over better! :) Super cute theme! That plate is so cute! I love the theme and that monkey plate is just too cute! 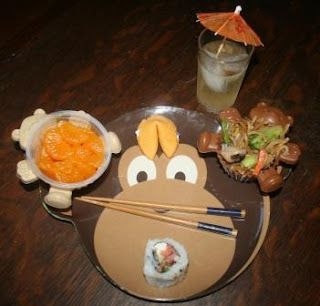 I absolutely love that monkey plate, and how you themed all the food to go with it! The umbrella in the drink is a good touch!